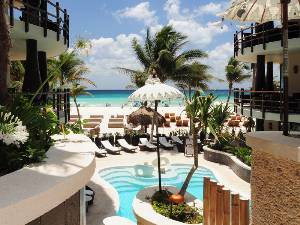 El Taj Ocean is located on the beach in the Premier Zone of Playa del Carmen, Mexico. 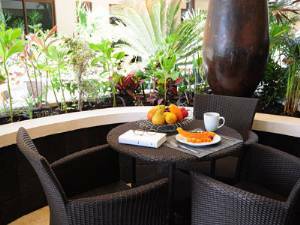 It is a condo/hotel equivalent to a 5 star property and has a restaurant/beach club, Indigo Beach Club with the best food, great service, and many ammenities. 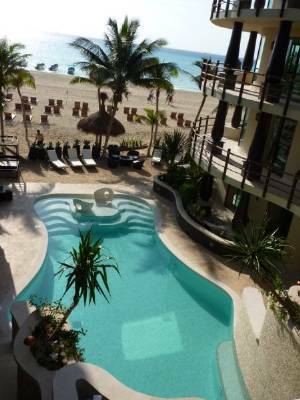 El Taj Ocean offers 1, 2, and 3 bedroom condo's overlooking the beach and water, as well as 2 and 3 bedroom Penthouse units. Penthouses are on the top (4th) floor and include private rooftops with jacuzzi, gas grill and lounge furniture. 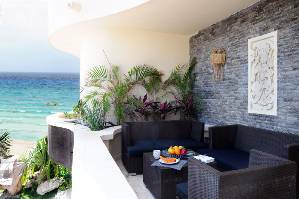 Many 2 bedroom units on the 2nd and 3rd floor also have private balconies with jacuzze/splash pool, electric grills and wet bar. 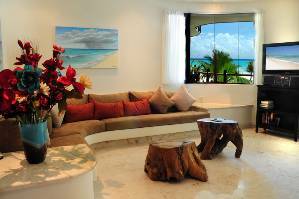 The main floor units are 20 feet above street level and the beach. 341 has best views of any of the 1 bedrooms. Full Kitchen with full sized appliances, coffee maker, micrwave, toaster oven, blender, cookware, dishes, glasses, etc. Deposit: Security Deposits A credit card with signature on file will be kept for any open balances or adjustments during your stay (in room mini bar, internet, phone, and concierge services). A $250.00 security deposit on your credit card will be required upon arrival. Excessive cleaning including upholstery, breakage, soiling or damage to the interior or exterior caused by the renter may be subject to additional fees to the renter. You are required to leave the unit as you received it. Cancellations and Refunds: Rates are based on available beds. The maximum occupancy includes the use of a living room sofa. Additional beds are $30.00 per day per person. 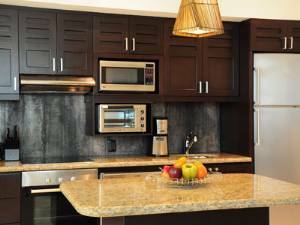 Each condo comes with the appliances and amenities as listed under details. 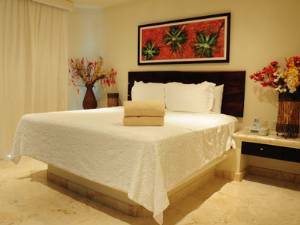 Rates include the following services: * Daily Maid Service * Towel and linen service * Purified water * Concierge Service * Parking Garage * Fitness Center * Beach Club * Please familiarize yourself with all the other items included with your vacation condominium rental. Any gratuity to house keeping or staff is always appreciated. Additional Services These services are available for an additional fee. * Wireless Internet * Local and International Phone Service * Massage * Concierge Services * Baby Sitting Making Reservations and Payments Reservations may be made by major credit cards (American Express, Visa, Master Card, Discover) and PayPal. Upon approval 50% of the total reservation amount will be charged to your credit card. The balance is due (30) thirty days prior to your arrival date. This balance will be automatically charged to the credit card on file. If the balance is not approved we will attempt to contact you in order to select an other method of payment. Failure to make the balance payment within two days from notification will result in cancellation of the reservation and forfeiture of the deposit on file. We recommend that you purchase Travel Insurance. All rates are in US Dollars. In cases where the arrival date is less than (30) thirty days your credit card will be charged the total amount. Cancellations Refunds for cancellations will be processed specifically as outlined below. Sorry no exceptions and cancellation fees are strictly enforced. To protect against cancellation caused by unforeseen events such as illness, strikes, weather, acts of GOD, Etc., we recommend you purchase Trip Cancellation Insurance to insure a refund of your deposit. Cancellation Fees 20% of the Condo Hotel rental price if the cancellation is received 30 days prior to the beginning of the rental period. 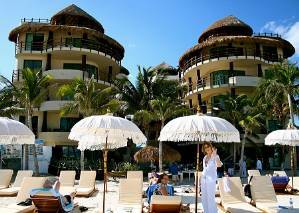 The total Condo Hotel rental price will be forfeited for any cancellations received after the 30th day prior to the beginning to the rental period. Other Fees: No additional fees. Please note there is a 10% discount for stays of 7 nights or more.